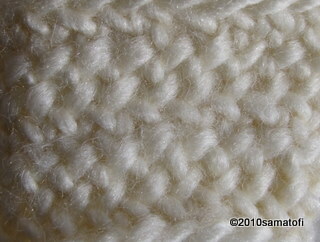 This stitch was developed by German Petra Ommen. The beautiful wavy surface appers when you nalbind this stitch to and fro, ie you turn the work at the end of each row like when knitting or crocheting. 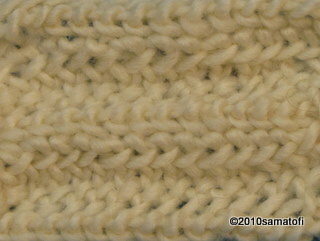 Same stitch, but worked as in a tube. 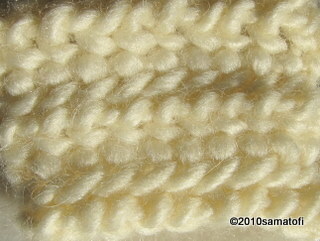 Same Stitch, but worked in a tube. 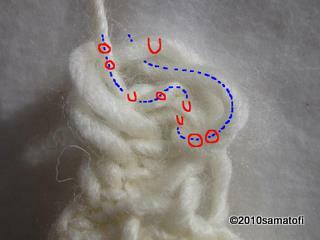 1 thumb loop, 2 loops onto needle from behind thumb. Pick up one of those two onto the needle for the second time. At the end needle under thumb loop, and under needle yarn.